I used to hate pre-production. Not because I didn't understand it's value, but because I just wanted to shoot something. NOW. But over the years, and headaches, and heartaches, and frustrations, and feeling completely lost.... I decided to come at it from another angle. Instead of feeling like it was something I had to do, it became something I wanted to do. Because pre-production is where you really start to see the film coming to life. Now, I almost refuse to shoot anything without at least some pre-production going in. But the reality is, a lot of folks think that showing up, figuring it out on the spot, and shooting whatever looks cool makes you a cinematographer/DP. And, sure, sometimes, that's how it goes. But there are so many things to consider before stepping foot on set, that to not at least have a skeleton of a plan is a recipe for disaster (or at the very least, something subpar that years from now you will probably cringe watching). Here is a list if things I try to consider, and talk extensively (or as much as possible) with the Director about before stepping on set. There are many more things to consider, but this is just a short list of some of the key things I personally consider before trying to capture anything on camera. This is another place where something like a MOOD BOOK can really come in handy, as it will immediately give the cinematographer and director the same place to start from as far as look and approach goes. Getting on the same page as your director is key. And this may involve disagreements over how to shoot it. But if you always have a reason WHY you want to shoot it a certain way so that it adds something to the story, and not just because it looks cool, the director will be much more likely to listen to you, and either try the shot now, later, or find a compromise. 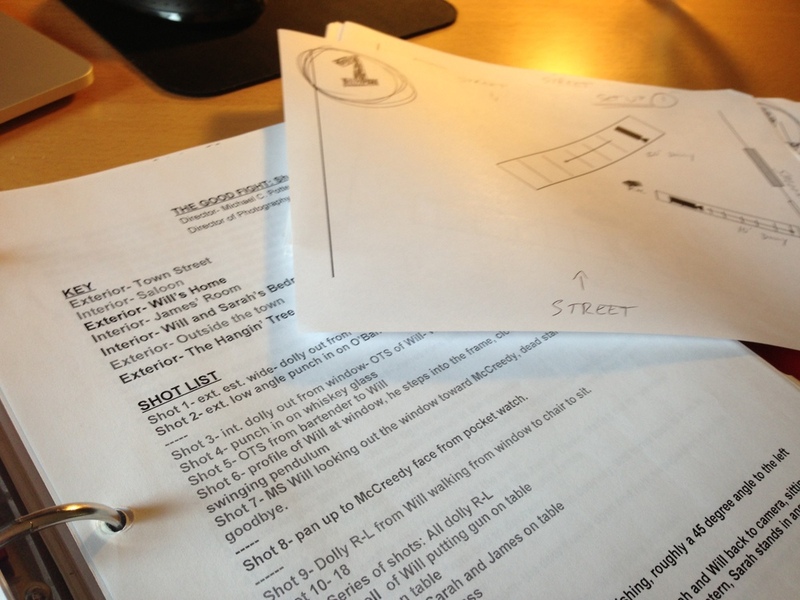 Once you and the director are seeing eye to eye, start storyboarding. There are some good programs out there, like FrameForge 3D, even though they can get pricey. There are some free options as well, like celtx, but they are more limited in what they can do as far as posing characters in a frame. But however you go about it, get some sort of storyboard made. Then, do your best to come up with a basic light plot. This is by no means going to be the absolute final lighting set up, but it will give you an idea of how things might be staged, which you can then share with your crew, and they can go set those lights up while you work with the director to plan out any last little details of the shoot- whether it be blocking changes, changes in camera movement, etc. And then, when everything is locked down, and you have your lens choices, the lights how you like them, and blocking and rehearsals have been done, SHOOT THAT SUCKER!